Hiking is one of my favorite activities, after fishing of course. 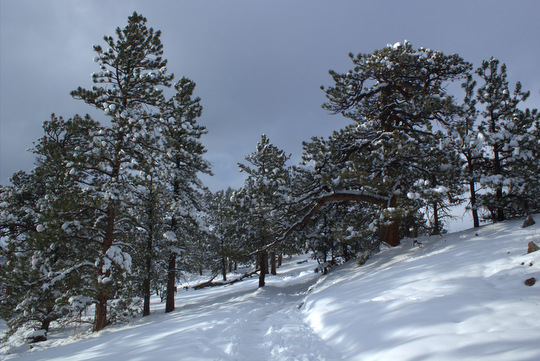 Hiking in the snow is always a blast, and with the fresh snowfall, I got out on Sunday to hike Mt. Sanitas in Boulder for the first time. What a great hike!!! 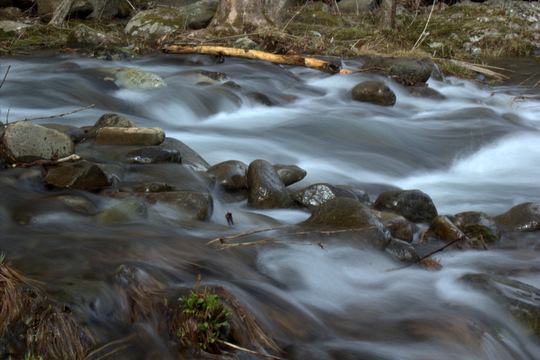 We had more open water last week on Boulder Creek than I have seen since last fall. Alas, ironically, more water over the weekend shut things back down at least a bit. The frozen precipitation that fell this weekend locked some of the better pools down again temporarily. 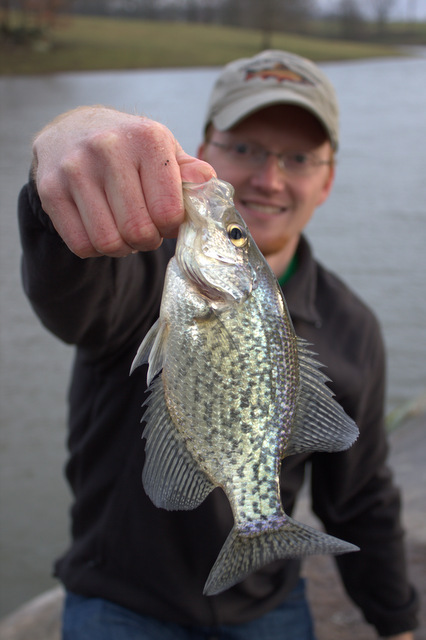 I fished last Wednesday evening for an hour and a half or so. The water was low and clear making the fish spooky. The weekend lockdown, while frustrating in the short term, is a real blessing as we need as much moisture as possible looking towards the summer months. Before the big snowstorm, the creek was waking up with good midge hatches. I even noticed some BWOs in the air at one point although not many. The fish were all sitting out in the open, obviously hungry after months of ice on the creek. The fish were on the feed for sure! While the stream was obviously begging me to fish a tiny dry/dropper rig, I willfully ignored that in favor of a small streamer. These days I often find myself preferring the streamer over anything else. Maybe on my next trip I'll bust out the 3 weight along with some small dry flies and midge droppers. Several fish gave chase to the streamer, but overall things were slow. Finally, one little brown rewarded my persistence. Not a bad mid-week outing on the stream!!! Several years ago, I was faced with a "shad" dilemma. A recent post on the Little River Outfitter message board reminded me of the great fun of fishing shad patterns during shad kills. I developed this pattern to not only imitate the size and color of the naturals but also to get down deep where the large fish often are. For those of you interested in fishing on top during shad kills, I recommend taking a guide trip with me or with my buddy David Perry. 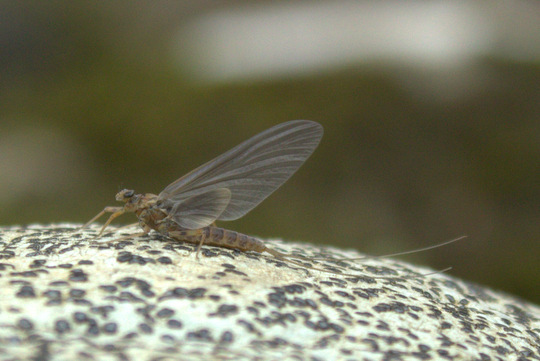 A favorite technique is fishing flies on the surface during this time. 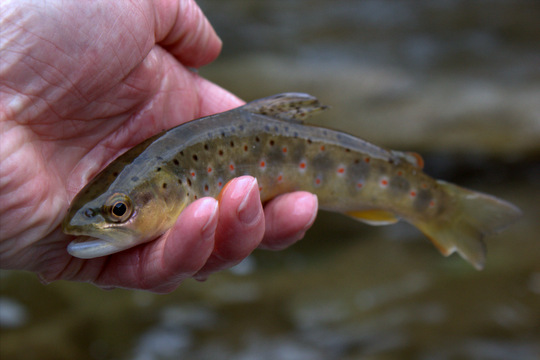 I can promise that there is nothing more exciting than a huge trout sipping a dying shad off the surface as delicately as it would a mayfly during a hatch. This pattern has been one of my favorites for big shad-eating stripers. In fact, I have caught more big stripers on this pattern than anything else. This fly can be modified to use plastic eyes so it has neutral buoyancy if you don't want it sinking too far. I call it the Puglisi, Bunny, and Jelly, PB&J for short. The little bit of red near the throat gives it a wounded appearance. I'm a firm believer in giving fish that extra trigger to induce strikes. Note that the eyes are tied in on the bottom instead of in the usual Clouser method. I find that for this pattern, it rides better and gets better hookups when the eyes are tied on the bottom of the hook shank. However, it is more likely to snag on the bottom this way. This fly is one of my bread and butter streamers. When all else fails, I toss some PB&J and the fish will usually eat!!! 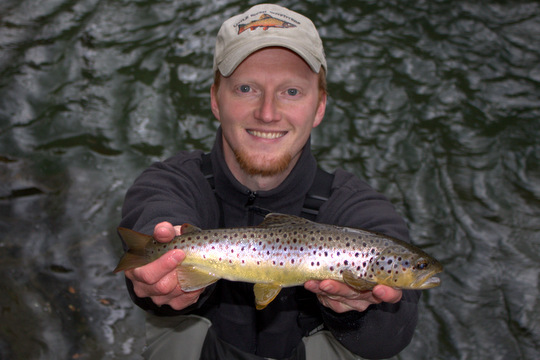 Spring in east Tennessee, Quill Gordons, Blue Quills, Black and Brown Stoneflies, rising trout....and don't forget the daffodils and everything else that combines to make this one of the best times of the year. Conventional wisdom says that the bugs should be hatching around the first of March give or take a week. By mid-month things should be pretty awesome, in a normal year that is. The new norm is, well, anything but normal. Last year the bugs were hatching a full month ahead of schedule in early February. Shoot, I even had a day in mid-February that was so warm that it was NOT prime fishing unless you arrived early in the morning. By noon the hatches were over. Fast forward a year and a warm and very wet winter has been followed by a cool and wet spring, make that cold and wet. My initial fears of arriving after the peak hatches were soon replaced by fears of no hatches. In the end the actual conditions were somewhere in the middle but closer to the latter extreme. My first day in the Park was last Tuesday, March 12. While driving into Townsend, a text brought a call from my buddy Josh Pheiffer who was heading into the Park to fish. After arranging where to meet, we were soon on the stream and looking for trout. In a couple of hours of fishing, we saw a handful of fish with the best being a 15-16 inch brown that I fished for but never even remotely interested in my offerings. 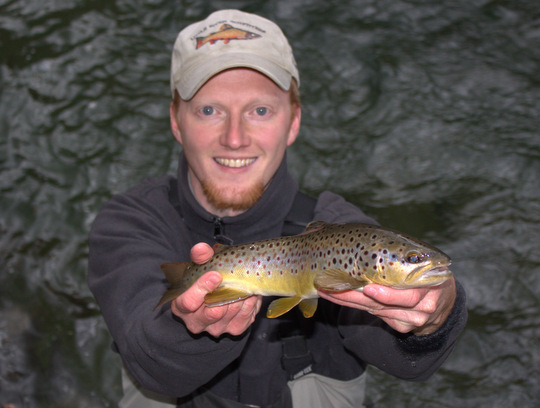 I also missed a healthy brown on a big Parachute Adams but that was it. The water was cold, high, and clear which made things a bit tricky. Finally we parted ways for the evening with my dad and myself heading back to Townsend for the night. The next morning brought back the excitement at being in the mountains. I knew that Wednesday would be the toughest day in the Park but was dead set on making the most of my time there. My dad was just along to hang out. It was great having him along to chat with and made the long fishless periods go much quicker. By mid-afternoon, the waters had warmed from frigid (upper 30s) to very cold (low 40s). I wasn't particularly hopeful and had decided to just fish streamers. My new 5 weight was rigged with a small white streamer like I fish out here on the local creeks. My seven weight was rigged with fast sinking line and a much larger streamer. I was covering my bases size-wise but was dedicated to fishing streamers on this day. Finally, in a pool recommended by my friend and Smokies big fish guru Joe McGroom, I spotted a rise. Huh??? The sun had not been out much, nevertheless, a few bugs were hatching here and there and soon I spotted a very nice brown rising to the snack. The two isolated rises did not deter me from my original intent and I was soon probing the depths with the seven weight. Gradually I worked out more and more line. Casting was tricky with all the trees and high bank behind me. However, I finally got something resembling a rhythm down. Two false casts with a vigorous double haul would land the streamer on the far side of the current. Three quick mends while throwing out more line soon had the fly swimming properly downstream and across. On one of these drifts, something slammed the streamer. Finally, a fish, I thought. Fighting the fish through the heavy current, I soon had a nice glimpse and was thrilled. Not a bad first fish of the year in the Smokies!!! My dad graciously came over and took the camera from me to document this beautiful brown trout. I couldn't wipe the smile off of my face. Something about catching a nice fish like this makes me appreciate my surroundings even more. Instead of immediately fishing even harder to catch another, I took a breather and used my camera to help me remember that moment. The water continued to roll past. 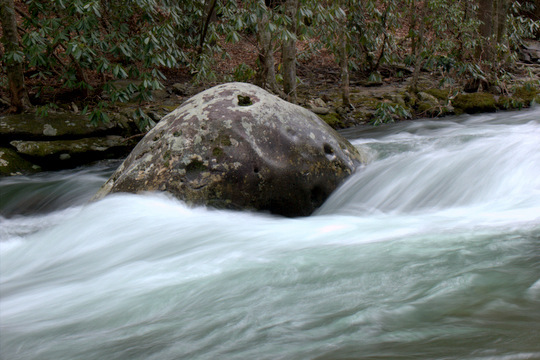 I noticed a single large boulder across the stream facing the onslaught of water and was impressed at the forces it had to withstand to still be there at the head of this pool. 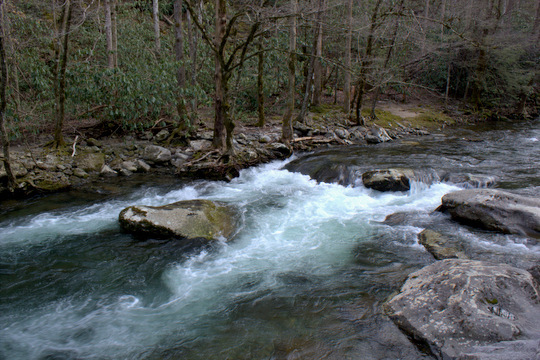 Many Smokies pools are completely different this spring as a result of the high water this past winter. Eventually, I felt like fishing some more. 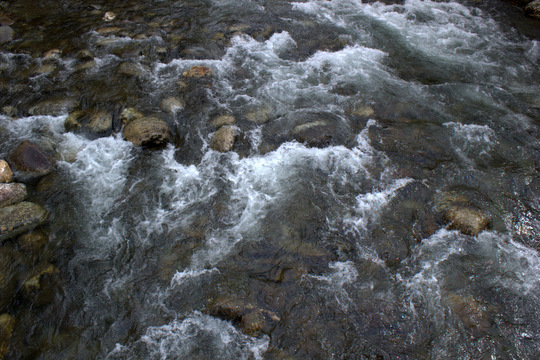 Further up river, I came to a nice undercut bank with deep soft water next to it. I just new there had to be a fish somewhere in there. The soft water reminded me that I was still carrying a 5 weight in addition to the heavier rod. I set the 7 weight down and started jigging the little streamer along the bank. 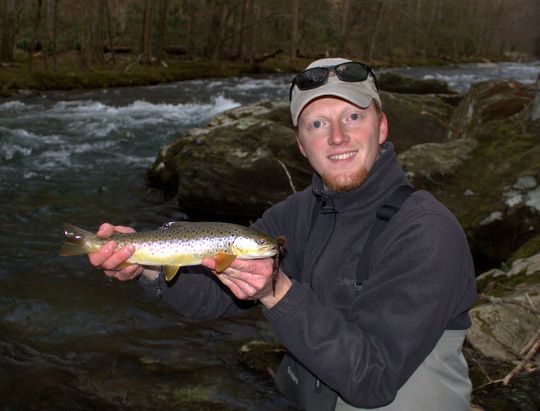 The second cast produced a spirited strike and soon I was admiring my second Smokies trout of 2013, a colorful 8 inch brown. Again, I paused to enjoy the beauty around me. On some trips, I almost wish that I could just photograph while someone else fishes, almost. There is something rewarding to me about not only coming into such close contact with nature by fishing, but also photographing the experience for rememberance later. My day was becoming better by the moment. 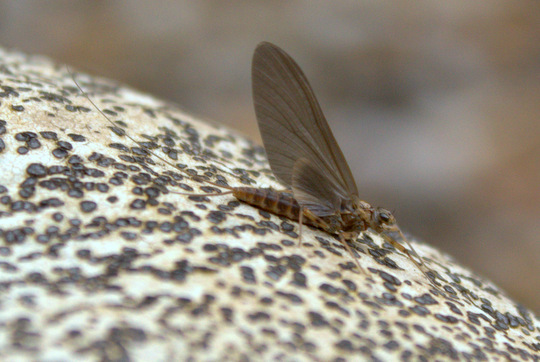 While landing the last fish I had noticed mayflies crawling out along the bank and quickly drying their wings. The cold weather had slowed down the hatches but not stopped them altogether. 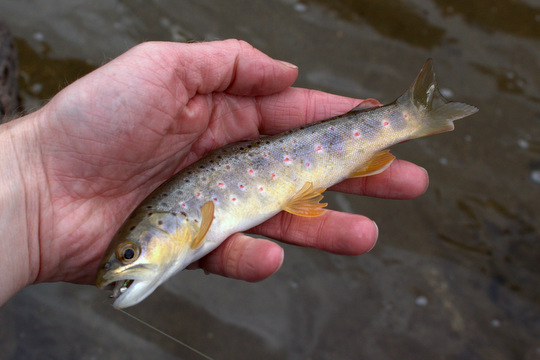 The little brown I had caught was obviously along that bank to eat the nymphs migrating to the bank to hatch. I paused to wonder whether a nymph pattern would have fooled the fish as well, coming to the conclusion that, yes, it probably would have worked just fine. The day was beginning to draw to a conclusion, but I had one or two more pools on my mind. Heading upriver even further, I soon came to the last pool of the day. Just one more, I thought to myself. By this time, I had changed over to a big dark articulated fly. 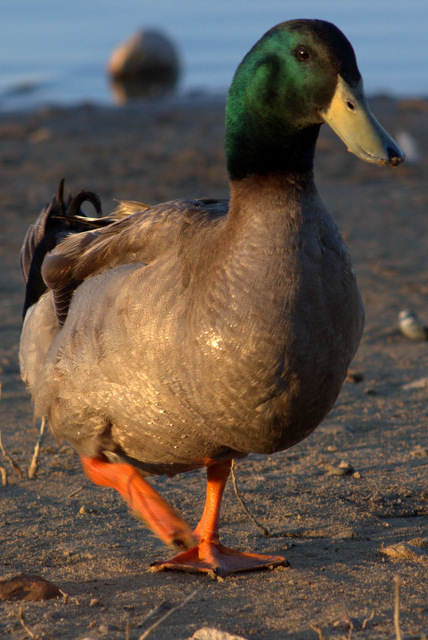 The second hook was cut off at the bend to remain legal in Park waters. Slinging the fly across the current and beginning the retrieve, I felt a tug after the first strip. An especially hungry brown had grabbed the fly, and I was excited again. What a way to end the day. Soon I had my third and final brown for the day to hand. My dad again graciously took pictures, and I slipped the hook out and watched the fish swim away. Considering the water conditions, I think it was a pretty amazing day on the water. Besides, the highlight of the trip for me was just seeing so many friends and family in Tennessee and visiting the Smoky Mountains. Catching fish was just icing on the cake. The final day of my Smokies excursion would bring yet another great experience, but more on that later. Meanwhile, here are a few more pictures of the streams. Traveling is a huge part of our sport. Exotic destinations call from the pages of fishing magazines and most anglers long to go to places like New Zealand, Chile, or maybe even just Yellowstone. That's a good one huh? Just Yellowstone....that place never ceases to amaze me. And of course there's always the good ol' reliable home waters. That one place that you could probably fish in your sleep and still catch something. For me, even though I now live in Colorado, that place is Tennessee and specifically the Great Smoky Mountains. 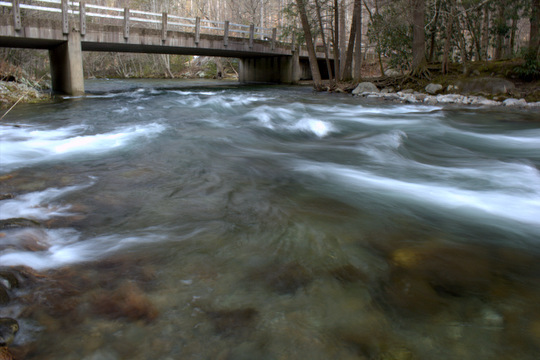 As home waters go, it is easy to undervalue the Smokies. 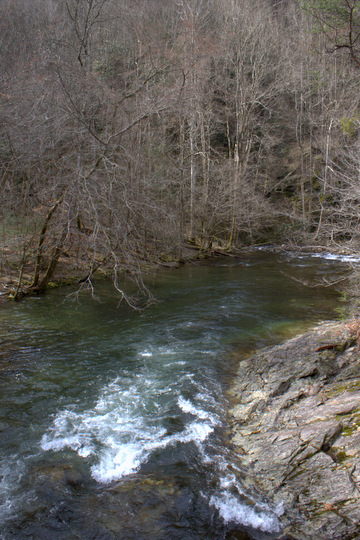 Blessed with lots of fish including some nice big ones, the Smokies are fishable year round. With ice locking down the local creeks for the most part, it is easy to yearn for the days of fishing whenever I wanted to back home. Now I'm heading back to visit friends and family for spring break. The Smokies are a must so I'm taking the fishing gear as well. My tying sessions are complete, or at least I'm out of time to continue, and now I'm anxiously waiting for the day of work to be over so I can get on that plane and head home. Yep, Tennessee is still home and probably always will be. I just hope I can remember that once I'm catching monster browns and rainbows out here this next summer. Each new place has a way of selling itself and inviting you to settle down and stay awhile. Right now though, I just want to go visit home. I'm hoping that while I'm traveling, I'll have time to share the journey. 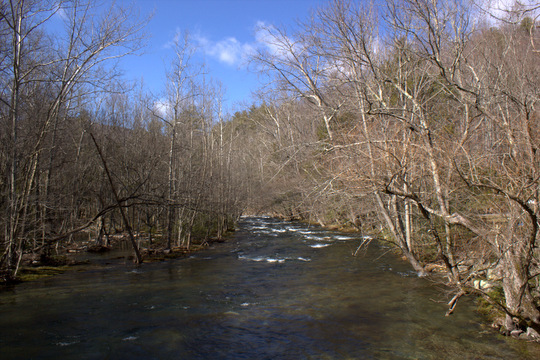 Early spring pictures from the Smokies and maybe some fish stories plus some time on local ponds should all add up to make some good entertainment. Stay tuned for more and come along on the trip with me as I am traveling. An Alabama fisherman was out fishing and found a lot more than expected. While we always like to catch big fish, this angler found one for the record books, easily breaking a long-standing state record and also the world record for land-locked stripers if the IGFA confirms it. For more on this including a picture of the beast of a fish, check out the story here. My tying activity has taken a decided turn in the busy direction. Last week I finished an order of Ultra Wire soft hackles for my blogging friend Bill over at the Fishing Through Life blog. By the end of the week I was starting to really crank out Parachute Adams for my upcoming trip to Tennessee. Yesterday I reached my goal and feel like I have enough now in sizes #12-#18. Of course, as a fisherman, I never feel truly ready so I may tie a few more for good measure. Other flies that came out of the vise yesterday were my bead head Ice Dub caddis pupa, my variation on an RS2 that is killer in the Smokies in early spring, and some bead head Pheasant Tail nymphs. I even managed tie tie a couple little #24 Krystal Flash Midges that were the secret to my recent Pueblo tailwater success. There were probably some other patterns that I'm forgetting but progress is being made!!! Tonight, with any luck, I will tie up some more nymphs and perhaps a few streamers. The weather is looking marginal at best for my trip so I'll have to have heavy nymph and streamer patterns around in case the water levels are up too high. Slowly the box is filling up, and of course I already have more flies than I know what to do with. One way or another I'll get by and hopefully have a few flies left over to use on the trout out here in Colorado. Still, until I leave for Tennessee, I will tie on in all my spare time! After reading his previous book, "The Fly Caster Who Tried to Make Peace with the World," I was interested in the next book from author Randy Kadish. The new book sounded like something I would like to have written. 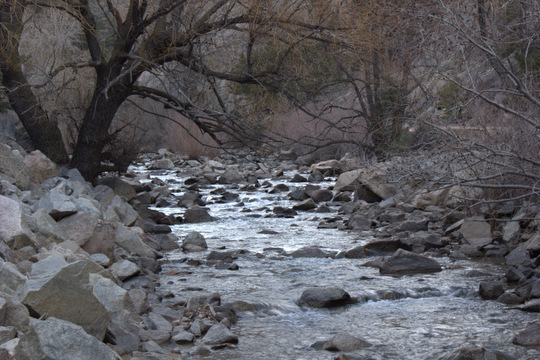 "The Way of the River" is a title that immediately leaves the would-be reader wondering what exactly that "way" is although the subtitle, "My Journey of Fishing, Forgiveness, and Spiritual Recovery," definitely helps clarify things. When Mr. Kadish contacted me about reviewing his newest book, I accepted quickly. While not a complete autobiography, Mr. Kadish invites the reader into some of the more difficult portions of his life. Diving quickly into the book, I discovered a past of pain and regret as the author visits his mother who is dying of cancer on a nearly daily basis. These last years of his mother's life bring the opportunity to reconnect on a level that was not possible earlier in his life. A difficult childhood had left its own scars and pain behind. And so, he turns to the river in hopes of finding healing and peace. "Am I hoping to borrow, in some way, strength from the river?" he asks early in the book (p. 11). 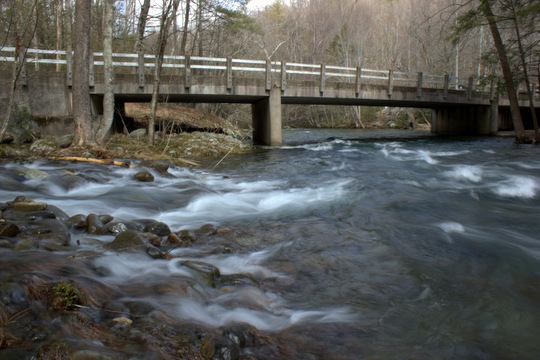 This line caught my eye, because when times have been difficult in my life and I had to face painful circumstances, I would often find myself drawn inexplicably towards the streams of the Smokies. Okay, I can relate to where this guy is coming from, I thought as I began to dig deeper into the book. One day, while visiting his mother, the author stumbles upon a jewel of wisdom that he passes on to his readers. She tells him that "You can't let the past write the future," which is something that caused me to pause and evaluate aspects of my own life (p. 10). Was I really where I wanted to be, and was I headed in the right direction? The problem of pain that Randy Kadish faces in his life and has now shared with the world is one that anyone who lives on planet earth must eventually face. Some face deeper hurts than others, but everyone suffers. As I read the story of one person's journey to recovery, I found myself thinking time and again of "The Problem of Pain," by C.S. Lewis as well as "The Great Controversy," by E.G. White. Both books provide detailed rationale for the pain experienced in our world, and I found myself wondering what it must be like to confront such a painful past in one's own life. Mr. Kadish is asking those big questions early in the book. In explaining about his first time at a Twelve Step meeting, the author says that the "first thing about the Steps I didn't like was the idea of believing in God. If there was a God, I couldn't understand why He had abandoned me in a violent, dysfunctional home, and why He had abandoned mankind to a succession of bloody wars" (p. 13). In finding an escape in fly fishing, Randy Kadish was only doing what so many other fly anglers around the world have done. Whether it is simply getting out of the house and away from a nagging wife, or trying to ease the pain and resentment of the loss of someone you love, many people find fly fishing to be an escape. Over time, Mr. Kadish begins to find enjoyment in more than just the act of fishing and begins to look forward to the interactions he has with other people while out on the stream or fishing off a pier in the Hudson River. Again I found myself relating as I remembered the pleasant memories of fishing the Tennessee River below Chickamauga dam. Eventually, I started to recognize the same anglers each trip. We would chat and compare notes, never mind that I was a fly angler and most of the others were bait or spin fishermen. When out on the water these differences can easily be forgotten when everyone is courteous and truly interested in their fellow man. Mr. Kadish has similar experiences, fishing with people from all walks of life who often have interesting questions about his fishing equipment, but in general accept him as one of their own because he is, after all, a fisherman. The pain in his life does not prevent him from accepting the small moments of enjoyment that routinely come with any fishing trip. Some stories are humorous, some contemplative and philosophical while others are sad, but all add up to make the book what it is, an enjoyable read that constantly has the reader wondering where the next step in the journey to recovery will lead the author. Overall I definitely enjoyed reading this book. In fact, my girlfriend can attest that I hardly put it down once I started reading. The only problem is a good one to have: at the end of the book I felt like there should have been more to read. And of course there was. Mr. Kadish is still alive and hopefully still enjoying fishing. Perhaps one day he will travel west and I might have the privilege of fishing with him here in Colorado or running into him on a stream back home in the Smokies. The only problem with meeting author's is that you're never sure if you will end up in their next book, but I guess that wouldn't be a bad thing. Randy Kadish never did find complete peace, but then, who does. However, he did work hard towards overcoming the pain in his life and at the end of the book, the tone has changed decidedly. "Yes, there are eternal, predictable laws of the infinite universe and a renewing force that is so much greater than myself it will never betray me, and it will always dwarf all my resentments and disappointments. Because this force is so beautiful, is it possible that, as Newton said, only a God could have created it?"(p. 146). In coming to terms with a Power much greater than himself, Mr. Kadish finally accepts that there is something much larger at work in the world and realizes that he himself can become part of something much greater. I'm hoping that there is another volume in his story for Mr. Kadish to write, moments of peace, happiness and satisfaction that are as deep and powerful as his previous pain was. I'm sure that fishing will continue to play a big and important role in the journey of life for Randy Kadish, and I look forward to hearing more of his story in the future. 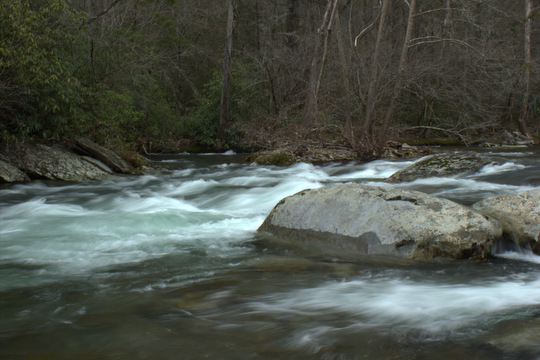 My buddy David Perry over at Southeastern Fly just posted an update on the Tennessee tailwater situation. Apparently Senator Lamar Alexander has introduced legislation to block those closings. Head over to Southeastern Fly and watch the video for more on this! Every year for the past 3 years or so, east Tennessee has had a cold first week of March. 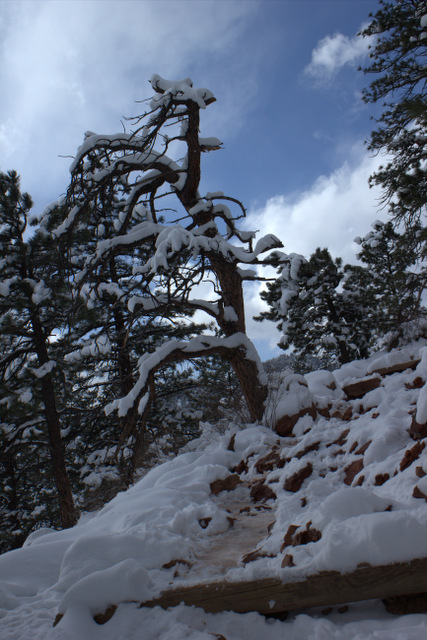 I was always glad to be heading out-of-state to places like the Everglades and the Grand Canyon for spring break. Also, each year had a warm second week of March. Since spring break out here in Colorado fell on the second full week of March, I was hoping to hit the weather right in Tennessee. So far it looks like everything is working out! With snow and cold temperatures in Tennessee right now, I'm glad that I'm not walking the banks of Little River looking for a hatch that may never start. The long range forecast calls for moderating temperatures. That means that while the bugs haven't exploded yet, they might be trickling off in fishable numbers upon my arrival. I've been patiently waiting for spring break but my patience is quickly wearing thin now. With only a week to go, I'm now tying flies during every available moment. Last night it was #18 Parachute Adams to match the Blue Quills. 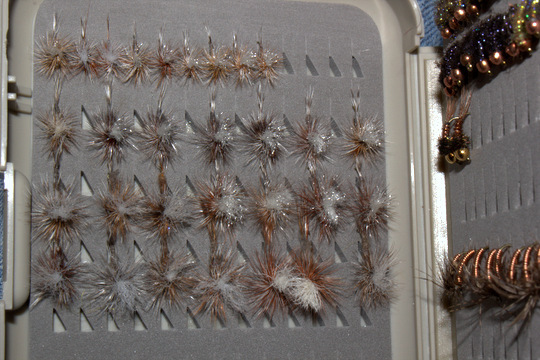 Today it will be more of the same as well as larger #12 and #14 flies for the Quill Gordons. I've stocked up on my Copper and Partridge Soft Hackle as well to match the caddis that will also be around. I tied plenty of Tellicos and other stonefly patterns weeks ago and am fairly confident with my supply there. Still, there is rarely a fishing trip that I feel completely prepared for. If all else fails I'll be stopping by to see my friends at Little River Outfitters and picking up a few extra flies if I run low. Lately I've been paying special attention to Ian and Charity Rutter's fishing report as well as Josh Pheiffer's. 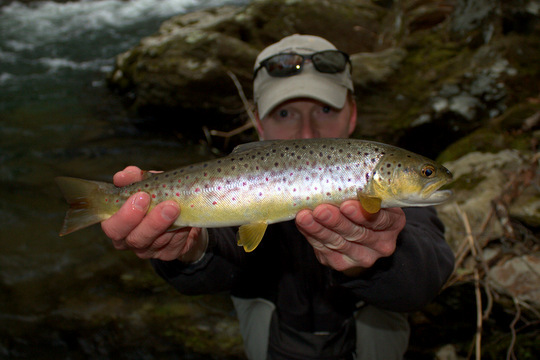 Both are excellent area guides that frequent both the mountain streams as well as the tailwaters. The most recent reports indicate that bugs are hatching sporadically but in general the big hatches have yet to happen. I guess I don't have a lot of options and will have to try and stay patient for another week. Going home will be a nice treat for spring break!! !